For the club in Berlin, see Matrix (club). Coordinates: 37°47′55″N 122°26′09″W﻿ / ﻿37.7987°N 122.4357°W﻿ / 37.7987; -122.4357 The Matrix was a nightclub in San Francisco from 1965 to 1972 and was one of the keys to what eventually became known as the "San Francisco Sound" in rock music. 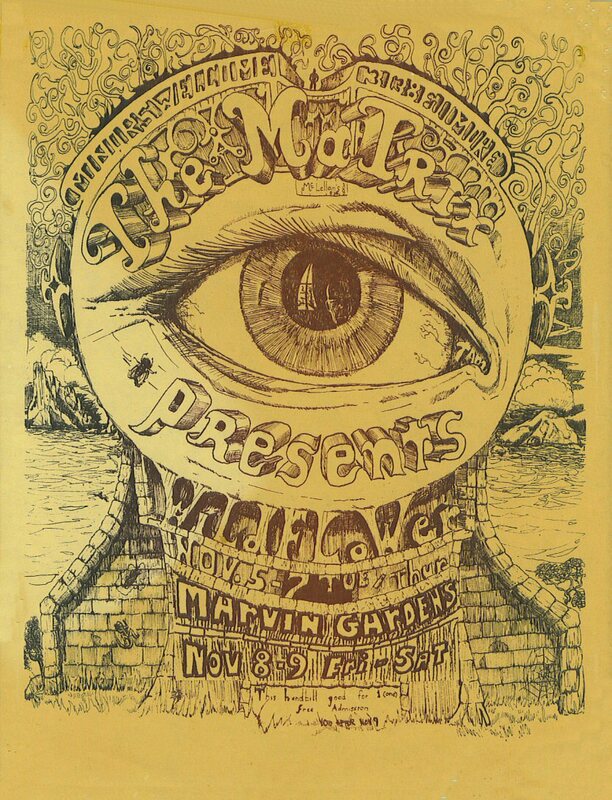 Located at 3138 Fillmore Street, The Matrix opened August 13, 1965 showcasing Jefferson Airplane, which singer Marty Balin had put together as the club's "house band". Balin had persuaded three limited partners to put up $3,000 apiece to finance the club's opening, giving them 75% ownership, while he retained 25% for creating and managing it. Jefferson Airplane rose rapidly to local prominence during late 1965 and early 1966 with their performances at The Matrix, and it was there that they were first seen by noted music critic Ralph J. Gleason, who became an early champion of the group. The Matrix was a favorite haunt of gonzo journalist Hunter S. Thompson in the late 1960s (see Fear and Loathing in America, c. 2000) and was also mentioned briefly in his book Fear and Loathing in Las Vegas during a flashback scene. During this period, Thompson was a contributing editor for the new tabloid magazine Rolling Stone, founded in San Francisco in 1967. Created and run by musicians, the Matrix was popular with local and visiting musicians, so on their off nights, many would go there to hear other groups they knew or just to visit. Management would waive the cover charge for prominent musicians who entered the club as customers. In the early years of The Matrix, there was a huge mural of the Four Horsemen of the Apocalypse on the left wall near the rear; rumor was that the members of Jefferson Airplane had painted it before the club first opened. The club's lighting was very subdued everywhere but on its small stage. The entrance was recessed about two feet and was left of center on the windowless wall seen from the street, and there was a cabinet outside to the door's right where upcoming bands were listed and handbills were posted. Inside, near the entrance, there was a bar (beer and wine license only) on the front left. The interior was about 50 by 80 feet. The ceiling at the front third of the club was about ten feet high, but farther back, it went up to about 18 feet. The right front area had chairs and most of the cocktail tables, while the center of the room to the rear was a dance floor. The stage was a step above the floor on the right side, center to rear. A small sound booth occupied the center of the left wall, and a few cocktail tables were at the left rear in front of the mural. The rear wall had a window opening for the small galley used to prepare food. Sometime in 1966 or 1967, Marty Balin sold his share of the club to Peter Abram and Gary Jackson, two of the original partners; they bought out the remaining partner. Abram actively managed the club room and made bookings while also recording those musicians he knew and liked. Jackson took care of accounting and general business matters. For a brief period toward the end of 1966, Bill Ehlert, better known as the "Jolly Blue Giant" or simply "Jolly", owner of the Jabberwock in Berkeley, took over running The Matrix. This brought a distinct change to the booking policy whereby Jabberwock favorites Country Joe and the Fish, the New Age and Blackburn & Snow performed. Another change was seen in the advertising of shows, with Jabberwock house artist Tom Weller producing some classic posters and handbills. In 1968, after finally getting all the necessary releases, The Matrix's owners sold to Columbia Records some tapes of live sets from 1966 by The Great Society (the band Grace Slick belonged to before replacing Signe Anderson in Jefferson Airplane). Edits of those tapes (including the first commercial recordings of "White Rabbit" and "Somebody to Love") eventually became two LPs, Conspicuous Only in Its Absence and How It Was (promoted as by "Grace Slick & The Great Society"). Over 20 years later, identical combinations of the two albums were re-released under different names as CDs by two different labels, because of separate licensing agreements in the US and the United Kingdom. Released by ABC Dunhill Records in 1969, the album Early Steppenwolf was material recorded live at The Matrix, purportedly on May 14, 1967, more than a year before the remodeling. However, the recordings were actually made when Steppenwolf was still called The Sparrow and were taped between May 9 and May 11, 1967 or between May 19 and 21. On May 14, the Sopwith Camel were playing the last day of a three-day set at The Matrix and The Sparrow did not appear. First released in the UK in 1984 by Edsel Records (a Demon Music Group label), Cheaper Thrills contains the best tracks from several Big Brother gigs at The Matrix before the band was well known. Like with many of the Matrix tapes, the actual recording dates have been lost over time. What is known is that the recordings were made in 1966 and 1967. The earnings from the Great Society tapes enabled a major remodeling of The Matrix, including a professional mixing booth and two higher quality tape decks, as well as major improvements to the sound and lighting systems. As part of its contract, Columbia Records also created a custom mixing board for the club, hoping for additional tapes of future live performances. The entrance was moved to the far right of the street wall and the ceiling was opened up to its full 18-foot height for the entire room. Just to the left of the entrance, against the street wall, was the new mixing booth, with its large, doubled-glass windows facing the main room. The stage was moved to the center of the left wall and was two feet above the dance floor, measuring 12 by 8 feet (instead of the 10 x 18 dimensions of the original stage). Large speaker systems were mounted near the ceiling in the left front and left rear corners. A new stage lighting system hung from the ceiling just in front of the stage. The Matrix continued to showcase local and visiting bands for a few more years. It was always a hangout for local musicians, famous or otherwise, both because of its history and because of the owners' respect for serious musicians. The club closed in 1972; although briefly reopening at a new location (412 Broadway, previously "Mr D's") in the fall of 1973. When The Matrix closed, a nearby bar, Pierce Street Annex, leased the space and moved in, remodeling once again, and turned it into a nightclub with only a DJ and no live music. After the Pierce Street Annex closed, then-Mayor Gavin Newsom's company, PlumpJack Group, took over in 2000 and renamed the space The MatrixFillmore. Live music was incorporated into the venue during the first few years; however, this layout was not a viable venue for live music and the program was dropped. The MatrixFillmore was one of the first ultra lounges in San Francisco. In 2017, the club name was changed back to The Matrix, described as a casual neighborhood bar with DJs and dancing on weekends. ^ View archival newsfilm shot by KRON-TV from February 1967, featuring band The Only Alternative and his Other Possibilities rehearsing at The Matrix: https://diva.sfsu.edu/collections/sfbatv/bundles/210748. ^ "PHIL ELWOOD: 1926-2006 / Beloved Bay Area jazz and blues critic". Retrieved 22 July 2016. ^ "Biography - Harvey "The Snake" Mandel - www.harveymandel.com". Archived from the original on 1 September 2016. Retrieved 22 July 2016. ^ "The Only Alternative and His Other Possibilities". Retrieved 22 July 2016. ^ "NR 7 Only Alternative + Other Possibilities Matrix Poster - Listing # 5367". Retrieved 22 July 2016. ^ Jefferson Airplane's first album, Jefferson Airplane Takes Off, had already been released to critical and popular acclaim, but Signe left the band after the birth of her first daughter. This page was last edited on 22 February 2019, at 08:52 (UTC).